A lot of things about this game stinks. They wanted to call it Judge but then it would be impossible to find. The promotion material looks crap. It sells for a dime. It wants to be Judge Dredd but it doesn’t have the license for it. All my alarm signals goes off and I wouldn’t be near this game if it wasn’t for SoVideoGamesPodcast’s recommendation. Turns out, it is a pretty decent tactical shooter. It reminds me of Hotline Miami, but it doesn’t have that unique aesthetic that HM has, and neither such a highly pretentious story. It is just a tactical shooter and that is fine. I think it does the tactical shooter part better than Hotline Miami does. You will never get shot from off screen and you don’t have to cheese your way through most of the game because it is too hard. 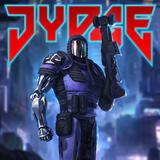 In Jydge you start each level with a main mission and some optional objectives. These objectives are “kill all enemies”, “don’t be seen”, “loot everything” and the likes. Your arsenal is very varied. You can equip your Jydge with lots of different weapons depending on you playstyle and you can configure your Jydge with abilities like walking through walls, stay invisible when not moving and so on. This gives the game variety as you try out different setups. I enjoy playing Jydge but it has some downsides. All the levels looks the same, so if the customization of your character offers variety, the challenges in the level design does not. There is a gated medal system that forces you to complete a number of objectives in the previous levels before moving on to the next one. I think this is implemented well in Sky Force but in this game it is just too repetitive to be enjoyable. Luckily I found out that you can turn this off in the options menu. The game is pretty short, which is a good thing. A bit of artistic art design and a better story, and this game could’ve been pretty great.